There are at least four ways that a DWI can result in the suspension or revocation of your license, and it can get pretty confusing. It's important to know which of the three ways are causing the hold on your license before moving forward. The way they are listed on your driving record will help. This is the suspension that occurs if you plead guilty to a DWI or DUI charge in court. If you got charged with a DWI and you showed up on your court date and just paid a fine, this will apply to you. A DWI/DUI points suspension is dealt with much in the same way that a regular points suspension except that it has a few extra requirements including a higher reinstatement fee and proof of Satop completion . If you have had more than one DWI, you will also be required to have an ignition interlock device installed. Visit our points suspension page for information on how to proceed. 2) Administrative Alcohol Suspension--This is the suspension that occurs if you were pulled over for DWI and you blew over .08% (or .02% and you were under 21 years of age). When this happens, the arresting officer seizes your license and gives you a 15 day driving permit. If you did not exercise your option to appeal the suspension by sending in a request for a hearing, OR if you had a hearing and lost, you will have an Administrative Alcohol Suspension for 90 days (or one year if you have had more than one Administrative Alcohol Suspension in a five year period). For First Time Administrative Alcohol Suspensions-- you will be completely ineligible to drive for the first 30 days unless you opted for immediate restricted driving privileges with the use of an IID. If you file an SR-22 within the first 30 days, you will be eligible for a Restricted Driving Privilege for the remaining 60 days of your suspension. You must complete Satop and pay a $45 reinstatement fee to have your full license reinstated. If You have Had a Prior Administrative Alcohol Suspension MORE THAN 5 years ago-- you will be completely ineligible to drive for the first 30 days unless you opted for immediate restricted driving privileges with the use of an IID. If you file an SR-22within the first 30 days AND have an IID installed on your vehicle, you will be eligible for a Restricted Driving Privilege for the remaining 60 days of your suspension. You must complete Satop and pay a $45 reinstatement fee to have your full license reinstated. Your IID device must remain installed on your vehicle for at least six months. In order to have your full license reinstated, you must file an SR-22, complete Satop, and maintain an IID on your vehicle for at least 6 months, and retake the complete driver exam. In order to have your full license reinstated at the end of the one year period, you must complete Satop pay a reinstatement fee, and retake the complete driver exam. If you were under 21 years of age when you received a DWI or if you pled guilty to possession of a controlled substance while driving a motor vehicle, you may have an Abuse and Lose Revocation. Visit our Abuse and Lose Revocation page for more info. What is IID (Ignition Interlock Device)? 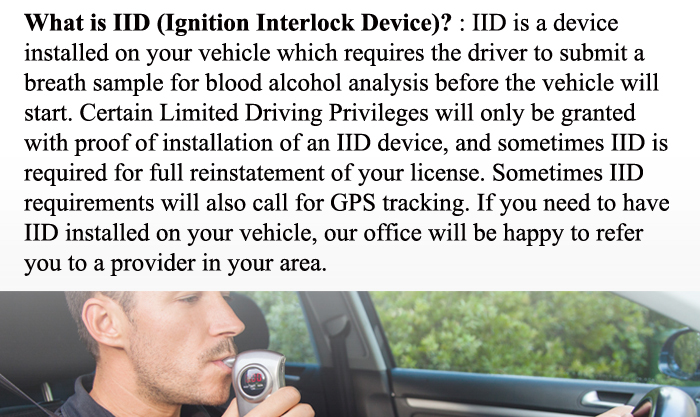 : IID is a device installed on your vehicle which requires the driver to submit a breath sample for blood alcohol analysis before the vehicle will start. Certain Limited Driving Privileges will only be granted with proof of installation of an IID device, and sometimes IID is required for full reinstatement of your license. Sometimes IID requirements will also call for GPS tracking. If you need to have IID installed on your vehicle, our office will be happy to refer you to a provider in your area. What is SR-22? : An SR-22 form is proof of insurance that your Auto Insurance Agent files with the state to guarantee coverage for a certain period of time (usually the requirement is 2 years). You can use your regular auto insurance agent or can use a completely separate agent for SR-22 insurance. Now that you've taken care of your Alcohol Related Suspension holds, you're ready to move on.